Femi Adesina, Abuja: President Muhammadu Buhari Friday in Abuja assured the people of Niger Delta that his administration would continue to support rapid development in the region by consolidating on all ongoing projects and initiating new ones to create more economic opportunities and jobs for the people. Receiving the Olu of Warri, His Royal Majesty Ogiame Ikenwoli, President Buhari reiterated the Federal government’s commitment to maintaining peace and security in the Niger Delta for economic and social activities to thrive. 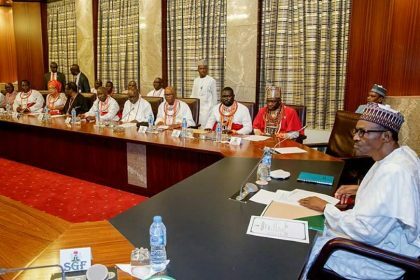 The President told the delegation led by the Olu of Warri that developing the region remains a priority for his administration, adding that under his watch every region in the country would witness increased investments in critical infrastructure. The President appealed to the people of Niger Delta to complement ongoing efforts by the Federal government to bring more development in the region by maintaining peace, security and harmony. President Buhari promised to look into some of the concerns raised by the delegation including the dredging of Escravos bar for Warri and Koko ports, the gas revolution industrial park and EPZ project in Ogidigben, the ecological challenges in Ode-Itsekiri, Ugborodo, Orere/Yanagho and Ogheye-Eghoroke, among others. The President also used the occasion of the visit by the Royal Majesty to commend Itsekiri people for producing men of strong convictions like Prof Itse Sagay, the Chairman of the Presidential Advisory Committee on Anti-corruption (PACAC). ‘‘Thanks for producing a man like Prof. Itse Sagay, who is defending us robustly and stepping on many toes in the process. If he’s not a man of conviction, he couldn’t have done that. ‘‘What he is doing is exceptional. Despite coming from a minority area, he’s showing overwhelming influence at the centre. ‘‘Prof, I never had the opportunity to thank you personally for all you’re doing. Thank you very much,’’ the President said. The Olu of Warri, who commiserated with the President over the loss of his two extended family members, also commended him for achieving his campaign promises on the fight against insurgency and corruption, as well as the successes recorded in reducing criminal acts of vandalism of oil and gas facilities in the Niger Delta. Later at a separate audience with Dr Ado Ibrahim Atta 111, the Ohinoyi of Ebira land, President Buhari thanked the royal father for his continued support of his administration. In his remarks, the Ohinoyi of Ebira land commended the President for his renewed interest in reviving the Ajaokuta Steel and expressed the hope that the project will come back to life and be inaugurated under Buhari’s administration. ‘‘You are a man of hope, courage and action. May all the good things you want for Nigeria come to pass,’’ the Ohinoyi said.